Number (#) of epidermal cells across the abaxial surface of leaves without papillae between the leaf margin and the stomata band for three species groups of Taxus. Numbers are plotted according to locality data on representative herbarium specimens of Taxus. 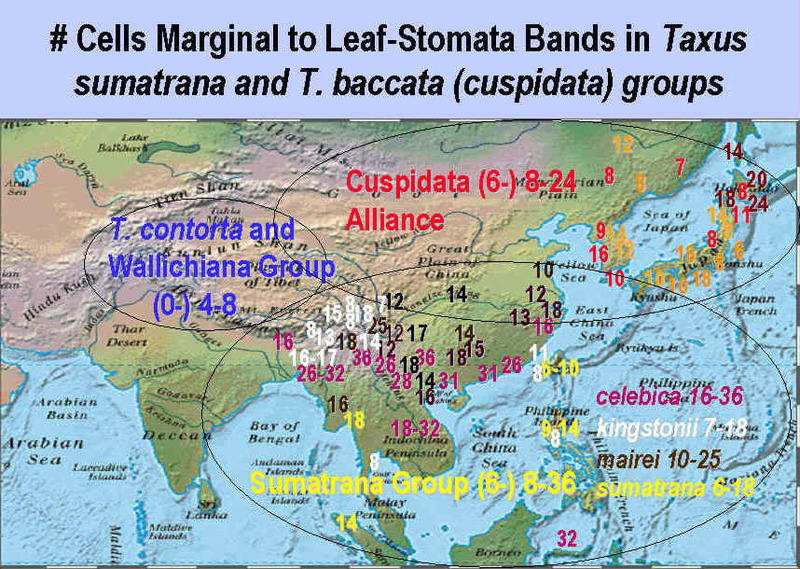 Data for the T. Wallichiana Subgroup and T. contorta (Baccata Group) are summarized to contrast their relatively narrow leaf margins—usually 4–8 cells wide—with that of the T. cuspidata Alliance (Baccata Group)—(6-) 8–18 cells wide, and that of the Sumatrana Group—(6-) 8–36 cells wide. To further contrast these groups, data for the Chinensis Subgroup (Wallichiana Group) were not included; their leaf margins, as might be expected, are intermediate in width, ranging from 4–12 cells wide. Data for these groups are further summarized in the following histograms. Number of Taxus specimens according to the number of bare cells (without papillae) across the abaxial surface of leaves between the margin and stomata band for selected taxa that occur in the E Himalayas to China. Note that the Sumatrana Group has the widest leaf marginal zone without papillae, most frequently 12 cells wide (18 specimens), but with another spike at 24 cells wide. These spikes generally correspond to leaves of T. mairei and T. celebica, respectively. Data for T. chinensis also appears to have two spikes, and it is interesting that the plants with the broader leaf margin resemble T. canadensis var. adpressa as exemplified and discussed under that species. This is in sharp contrast to leaves of T. wallichiana that have the narrowest margin, mostly 4 cells wide (40 specimens); additionally, five specimens of T. wallichiana were also found to be entirely papillose, not shown because the zero datum would not properly score by the computer software that was employed. The Cuspidata Alliance is recognized by leaves spreading from branchlets more by their petioles than by their (curving) blades, and by the leaves usually lacking papillae across a relatively broad marginal zone, from (6-) 8–18 (-24) cells across. This is in contrast to leaves of the T. baccata Alliance that generally spread from branches by bending (curving) of the leaf blades in which the blades often appear falcate (T. baccata) or recurved (T. recurvata, T. fastigiata), and abaxial marginal cells that usually lack papillae on 4–6 cells across. The differences in the development of papillae along the abaxial leaf marginal zone between the Cuspidata and Baccata Alliances are not always sharp due to exceptions that occur more frequently in the Baccata Alliance, especially in E and N Europe and SW Asia. Generally, papillose cells seem to be always present between stomata bands and leaf margins in the Baccata Alliance, but are frequently lacking entirely in the Cuspidata Alliance. There are other leaf anatomical differences that need further study. These include the epidermal cell walls that appear as papillose ridges in the Cuspidata Alliance but not in the Baccata Alliance, the palisade parenchyma with two palisade rows of cells in the Cuspidata Alliance, one row in the Baccata Alliance, and resinous parenchyma cells in spongy mesophyll that is usually evident in the T. baccata Alliance but not in the Cuspidata Alliance. Three species complexes within the T. cuspidata Alliance are recognized by differences in habit, phyllotaxy, seed shape, and whether seed matures on 2nd yr or older branchlets, or on current season growth. (1) Taxus canadensis complex, monotypic with 3 varieties occurring in NE North America and Euro-Mediterranean. Often monoecious; 2nd yr or older branchlets yellowish green; leaves ± in two-ranks, stomata (4-) 5–11 rows/band; seed cylindrical to globose, round, mostly on 2nd yr or older branchlets. (2) Taxus cuspidata complex with T. biternata, E Asia. Usually dioecious; branchlets yellowish orange; leaves ± in two-ranks, stomata 7–15 rows/band; seed globose, angled, tapering to apex, usually on 1st yr branchlets (except cultivars). (3). Taxus umbraculifera complex with T. caespitosa, 6 varieties, E Asia. Usually dioecious; branchlets yellowish orange; leaves spreading ± radially, stomata 9–17 rows/band; seed widest near base, conical, rounded, often sharply pointed, usually on 1st yr branchlets (except cultivars).